Nations around the world are working to manage plastic waste. Many solutions are cost prohibitive, particularly for third world countries. In some parts of Africa, plastic bottles are burned in cooking fires, which exposes people and the environment to many dangerous toxins that are emitted when they are burned, such as polyvinyl chlorides (PVCs) which are regularly found in plastic bottles and other packaging. PVCs are particularly dangerous toxins because they are bioaccumulative, which means they accumulate in living tissue and through the food chain, increase the damage of this type of pollution. Burning such plastics also discharges high concentrations of carbon monoxide, dioxins, furans, and many more chemicals dangerous to human health, the natural food chain, and the atmospheric environment. On the more positive side, there are communities where plastic wastes are being used sustainably. 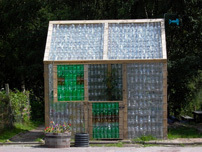 One amazing example are PET bottle homes. PET, which stands for polyethylene terephthalate, is a form of polyester (just like the clothing fabric) that is extruded or molded into plastic bottles and containers to package food, beverages, etc. The first PET bottle home was built in South America. A two-bedroom structure can be built using 14,000 such bottles. Such a structure built from PET bottles filled with sand is 20 times stronger than the same structure if built of concrete, also, it is both bullet and fireproof, earthquake resistant, and withstands tropical climates! Nigeria is currently looking to PET-built housing as a strong solution not only for waste management, but also for affordable housing, and providing a higher level of environmental protection. In the United States, plastic bottle recycling hovers at about 30%. A Greensboro, NC, textile company (Unify) saw an opportunity and created a new fabric called REPREVE. Unifi’s North Carolina REPREVE recycling center turns recycled plastic bottles into amazing products that we can use and even wear. This year 400,000 students from Michigan, Brown, University of North Carolina, Chapel Hill will wear graduation caps and gowns made out of recycled plastic bottles. Similarly, Nigeria Vitafoam, a leading manufacturer of flexible, reconstituted, and rigid foam products produces a wide variety of sleep and comfort products using finely shredded polyether to make mattresses, pillows, and furniture foam. For their products, Vitafoam collects plastic bottles from communities, as well as hotels, offices, and restaurants. As these endeavors gain momentum, it is the hope of all that environmental protection shall continue to gain strength as a global issue so that each generation leaves behind a better world.